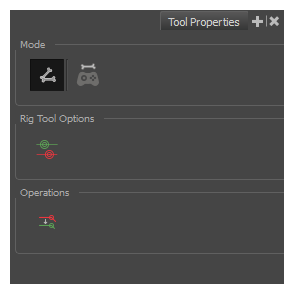 In the Tool Properties view, you can customize not only the behaviour of the tool but also the settings of the deformers that you will create. Bone Mode Sets the Rigging tool to create Bone deformers. Game Bone Mode Sets the Rigging tool to create Game Bone deformers. Show All Manipulators (Show All Controls) Lets you immediately see the resting position in red (Setup) and the animated position in green. Reset Deform (Reset Current Keyframe) Copies the resting position of the deformation skeleton to the current frame.